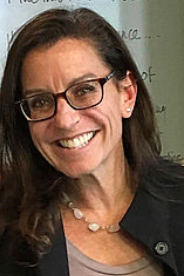 A trained mediator, communications studies professor, licensed lawyer, and workshop leader, Israela Adah Brill-Cass has more than 20 years of experience with negotiation and conflict resolution. Right at the edge of campus, tucked away via a nondescript parking lot side entrance in the basement of Russell House, you’ll find the on-campus home of Israela Adah Brill-Cass, Wesleyan’s first ombudsperson. Walking through the unmarked screen door can feel a bit unnerving, like trespassing unannounced or entering through a secret back entrance, but Brill-Cass soon welcomes you into the comfort of her office. It’s a small and simply decorated space with bright textile prints on the wall and soft music offsetting the quiet that comes with being the only inhabitant on the entire floor. The remote location and private access are by design, to help ensure the promise of confidentiality that is a crucial component of Brill-Cass’s work. “Visitors” (as Brill-Cass calls those who come to see her) schedule appointments ahead of time through her website and are staggered so that there is less chance of others seeing who stops by. As Wesleyan’s inaugural ombuds, Brill-Cass serves as an objective, independent resource for faculty and staff, providing a safe space where individuals can talk through any workplace issues they may be experiencing without automatically triggering an investigation or required next steps. The role is one that complements the work of other Wesleyan resources such as Human Resources and the Office of Equity and Inclusion, but unlike those departments, which are part of the University organization, the ombuds is an independent contractor position, and therefore completely neutral. Since coming to campus in August 2017, Brill-Cass has welcomed visitors from all areas of the University and across all ethnicities and genders. For the most part, consultations have revolved around normal workplace concerns about transparency, unclear job parameters, conflicts with colleagues, personalities, managing styles, etc. Brill-Cass makes it clear that there is no subject she’s not willing to discuss and even if visitors are unsure if she is the right person to talk to, she’s happy to point them in the right direction. Brill-Cass offers on-campus ombuds appointments on Thursdays, but can be available at other times via email or FaceTime, if necessary. To schedule an appointment, access her website through WesPortal – Employee Information, or go directly to www.fixerrr.com.